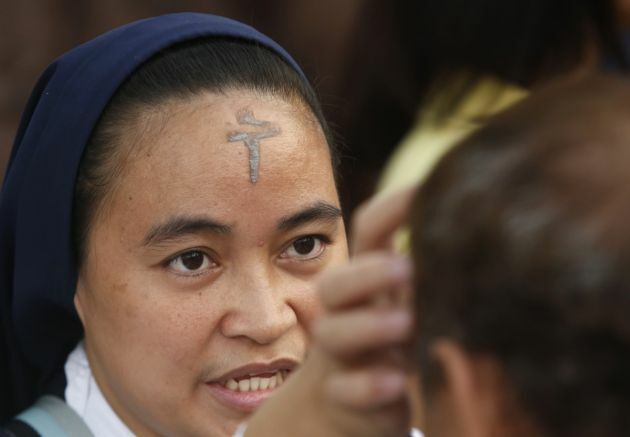 (Photo: REUTERS / Erik De Castro)A nun marks a cross on the forehead of a devotee during the commemoration of Ash Wednesday outside a Roman Catholic church in Paranaque, Metro Manila March 5, 2014. Catholics in the country celebrated Ash Wednesday, which serves as a reminder that "as a man is dust, so unto dust he shall return" and marked the beginning of a 40-day period of Lent in the Roman Catholic calendar where many devotees in the Philippines will start the season of fasting and prayers. Philippine health officials have discouraged priests in a dormitory city of the capital from administering the Sacrament of Anointing of the Sick to a patient recently diagnosed as having a lethal disease. The person concerned has been afflicted with the dreaded Middle East Respiratory Syndrome Corona Virus (MERS CoV) virus. In a news conference at San Pedro City, Laguna, acting Health Secretary Janette Garin said the ministry of priests requires close contact with people. He said it would be best not to mingle with people such as health workers assessing the situation. "Because (of the) priests' ministry to the sick that requires them to face and make direct contact with the patient, they are strictly prohibited from doing it, for the meantime, to avoid contamination and passing it on to parishioners," said Garin. He was speaking to parents, teachers, students and city officials at the Pacita Elementary School on Friday. The official issued the warning after reports circulated in the city that a Catholic priest had purportedly been requested to administer the sacrament to a nurse afflicted with MERS-Cov in the city. The victim had been admitted to a local hospital, before health workers brought her to a specialized government facility for isolation and quarantine. Garin allayed fears that the virus would easily be transmitted, explaining that afflicted patients could infect other people through direct contact. An elementary school in the city closed down on Feb. 13 as parents stopped sending their children to class after learning the victim had been brought to the hospital next door. The health department also ordered the temporary closure of the hospital where the patient had been first brought to allow the quarantine and disinfection the facility. Nurses who attended to the needs of the patient had also been ordered to into quarantine to verify whether they were afflicted by the virus. The parish near the hospital discouraged churchgoers to receive communion through the mouth, saying that increased the chances of transmitting the virus from one person to another. The situation is akin to that in West Africa where faith practices in Ebola-hit areas have had to restrict physical contact between people in affected areas.